Fabric Sizing - How we Size your Fabric at Outback Yarns, Everything You Will Hopefully Need to Know! Here at Outback Yarns, we want to clearly let you know how we size cut the fabrics from the bolt before we send it to you in the post. We have split our bolts of fabric into Fat Quarters to make it easier for us to keep control of our stock levels and to keep the units whole numbers. 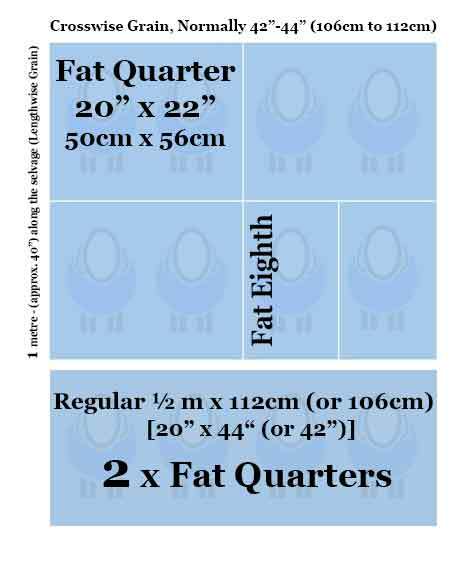 Fat Quarters – approximately 50cm x 56cm / 20” x 22”. Fat Quarters are a 50cm length of the bolt which is then divided into 2 cuts midway along the width of the fabric to give a 21"-22” piece of fabric (approximately 50cm to 56cm). If you wish to purchase A Half metre (50cm or approx. 20") of the bolt of fabric, then you would purchase 2 x Fat Quarters (2 Units of Fat Quarter) and we would send these at 1 piece 0.5x1.1m approx. This applies for each length in half meters. Panel - A panel of fabric which will be the size of the design (typically the width of the bolt [42”-44” / 106cm-112cm] x the height of the design.